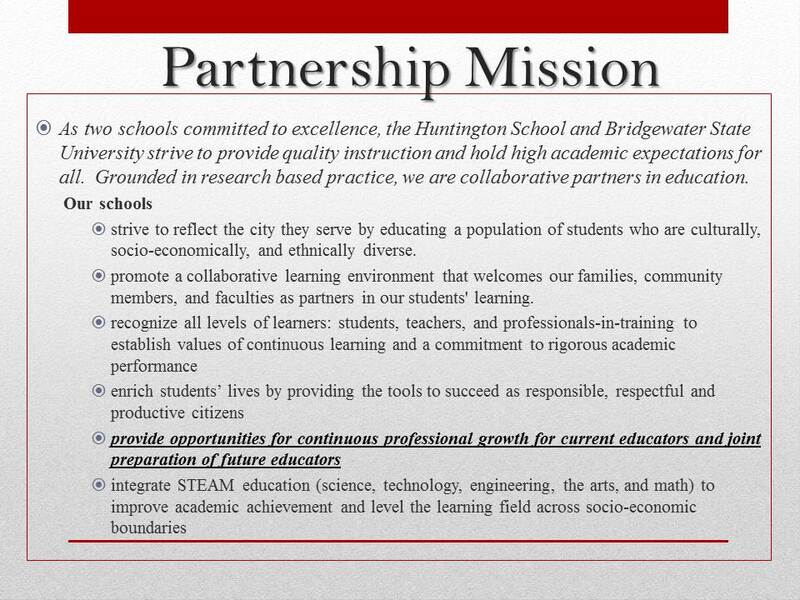 The mission statements were created between the partnering schools and Bridgewater State University to define the goals each school would like to achieve. As two schools committed to excellence, the East Middle School and Bridgewater State University strive to provide quality instruction and hold high academic expectations for all. Grounded in research-based practice, we are collaborative partners in education. ​As collaborative partners committed to excellence in education, both schools are committed to helping all students master the 21st Century skills to become college and career ready. Bridgewater State University and the Edgar B. Davis school strive to provide quality instruction and hold high academic expectations for all. Grounded in research-based practice, we are collaborative partners in education. ​Through developing and supporting prospective teachers, it is our mission to foster powerful and relevant learning experiences for all students. The Professional Development School Partnership between Bridgewater State University and the Edward F. Leddy Preschool will serve as a model for innovation and collaboration in teaching and learning amongst preschools in the Commonwealth and throughout the nation. The Edward F. Leddy Preschool thrives on collaboration with BSU, ancillary agencies, Head Start, and other local preschools to provide an excellent foundation for our students at Leddy Preschool. Our collective students will mutually benefit from a strong partnership and their students in turn will benefit from strong teachers trained in excellence and collaboration. As two schools committed to excellence, the Huntington Elementary School and Bridgewater State University strive to provide quality instruction and hold high academic expectations for all. Grounded in research-based practice, we are collaborative partners in education. ​Together the Raymond School and Bridgewater State University are committed to providing a mutually beneficial and enriching educational experience for all participants in this partnership. The professional staff of the Raymond School pledge to provide support and guidance, and together with BSU, will share solid, research-based best practices with the college learners. As collaborative partners in education, every effort will be made to provide our K-5 students with rigorous and challenging instruction that will deepen their understandings and provide an outstanding educational experience. ​Central School in partnership with Bridgewater State University, strives to create a rigorous and well-rounded instructional environment that promotes individual excellence for all students through high quality professional development, authentic learning experiences, and continuous collaboration on evidence based practices in the field of education. Strive to create a nurturing Early Childhood educational environment that is child-centered and supports students’ social, emotional, linguistic, cognitive and physical development. Partner to develop and deliver balanced literacy instruction focused on listening, speaking, writing, and the five areas of reading: phonemic awareness, phonics, fluency, vocabulary, and comprehension. Promote STEM education and the implementation of the Next Generation Science Standards (NGSS) through professional development and hands-on inquiry based instruction. Provide high-quality professional development and authentic learning opportunities for teachers and practicum students. Encourage inclusive teaching practices to meet the diverse needs of students. Support future educators by providing them with varied learning opportunities across grade levels and educational environments that allow them to work with students with diverse needs. Through developing and supporting prospective teachers, it is our mission to foster powerful and relevant learning experiences. The Professional Development School Partnership between Bridgewater State University and the Mulcahey Elementary School will serve as a model for innovation and collaboration in teaching and learning amongst schools in the Commonwealth and throughout the nation. Our collective students will mutually benefit from a strong partnership. The Mary E. Baker Elementary School and Bridgewater State University, as partners in education, form this collaboration to ensure that all involved are provided with a rigorous, enriching educational experience that creates lifelong learners. As collaborative partners in education, our two schools are committed to helping all students master the 21st century skills to become career & college ready. provide opportunities for continuous growth for professional educators, both vocational and academic, and joint preparation of future educators. promote opportunities for all educators that help build both strong pedagogical practice and content knowledge. integrate disciplines so that students can practice responding to varying real-world demands of audience, task, and purpose. ensure that all educators use technology and digital media strategically and capably and explicitly teach technology tools within disciplines to all students.